When we talk to Fortune 500 companies that put in the work to improve performance, perf metrics will often rapidly regress once they return to feature development. Performance budgets help teams prioritize features, optimizations and facilitate discussions on what is really important to users. Metrics for perf budgets can include milestone timings, quantity-based metrics or rule-based metrics. Milestone timings: timings based on the user-experience loading a page (e.g Time-to-Interactive, First Contentful Paint). You’ll often want to pair several milestone timings to accurately represent the complete story during page load. Some teams also maintain custom metrics, like “Time to first tweet” for Twitter. Rule-based metrics: scores generated by tools such as Lighthouse or WebPageTest. Often, a single number or series to grade your site. An example of a “rule” based performance budget in action. Using Lighthouse CI, we can enforce budgets on a performance score. PRs can be failed if their perf score falls below a certain value. Below is a quantity metric — JS Size for The Guardian’s desktop site on SpeedCurve. It highlights in yellow when under budget and red when over budget. We can also visualize a milestone metric. Below is First Interactive (now First CPU Idle) — marking the point when the browser’s main thread is not blocked for more than 50ms by any single task so user input can be responded to quickly. This may suggest having budgets for different device classes are worth considering. e.g. < 170KB JS (min/gzip) for mobile and < 1.5MB for desktop where users may have faster CPUs and network connections. Often, non-engineering stakeholders are unaware of the performance consequences of their decisions on features or design. This is not their fault. We need to make it easier for PMs, designers and stakeholders to understand the user-experience impact of their choices. Even better is if we can make performance part of project goals from the start. This shifts the mentality of perf budgets only being a factor thought of during development to one where it’s key throughout the project lifecycle. As with any financial budget, there may be times when your perf budget will be low. This can require you to make cuts or trade-offs in order to maintain a consistently fast user-experience. What features are really important to your users? Which ones excite or retain them the most?. This is a difficult conversation and is not always clear cut. This conversation can result in dropping one feature to allow for another. ‘Dropping’ could mean removing it from the critical-path — the feature could still be loaded on-demand at a later point when the user needs it. In such situations, you can make a call on a page-by-page basis while consulting the performance budget as the source of truth so you can continue to reach your goals. Performance budgets are aided by having internal processes for operationalizing a performance culture within a business. Organizational performance budgets ensure that a budget is owned by everyone rather than just being defined by one group. Perf budgets can’t be something only engineering teams care about. 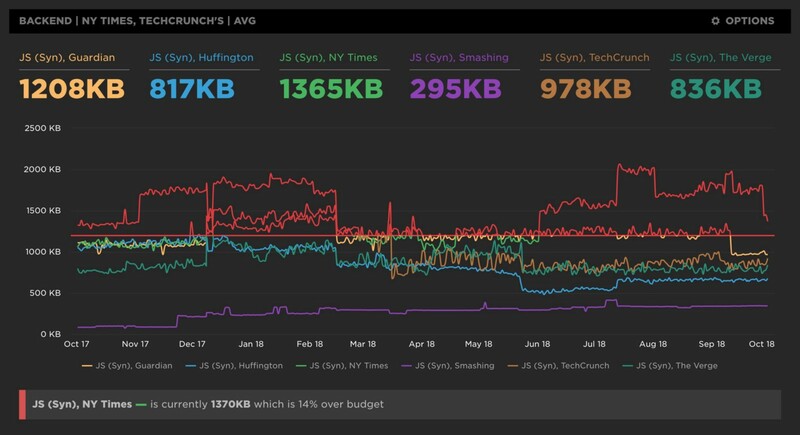 When budgets have been set and the entire organization is aware early on what the budget parameters are, you’re able to say performance isn’t just an engineering issue, but a critical piece of the whole package as a site is constructed. It provides a guideline for design and engineering when considering performance and should be checked with each decision that could impact performance. 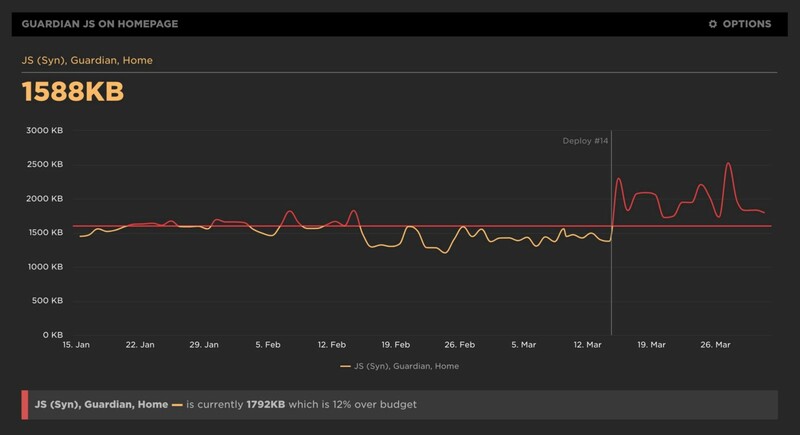 Monitoring services like SpeedCurve also enable you to benchmark your site against competitors, allowing you to easily visualize how they perform on your budgets. This can be a powerful aid when speaking to stakeholders about why staying “under-budget” is important. Many tools exist for enforcing performance budgets. SpeedCurve support setting budgets for a wide range of metrics, resource sizes and Lighthouse audit categories. 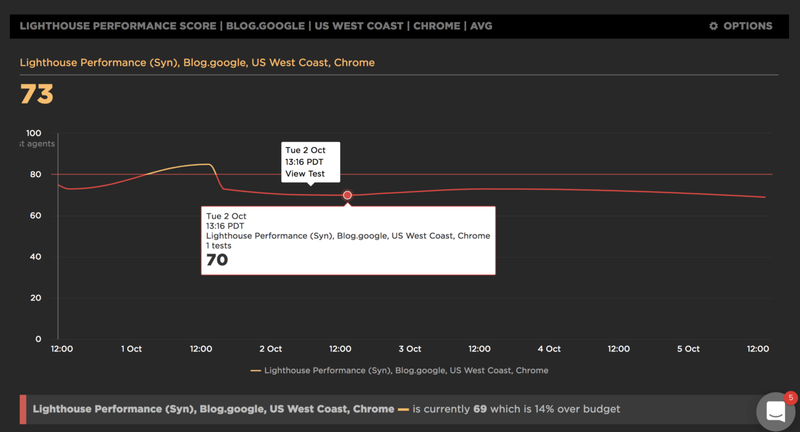 A demo tracking the Lighthouse performance score of blog.google with a budget of 80/100. Red shows where the budget has been exceeded. Zillow use SpeedCurve to set budgets for their quantity (e.g. image size) and milestone timing metrics in mobile search. Other performance monitoring services like Calibre also support setting budgets and alerting. 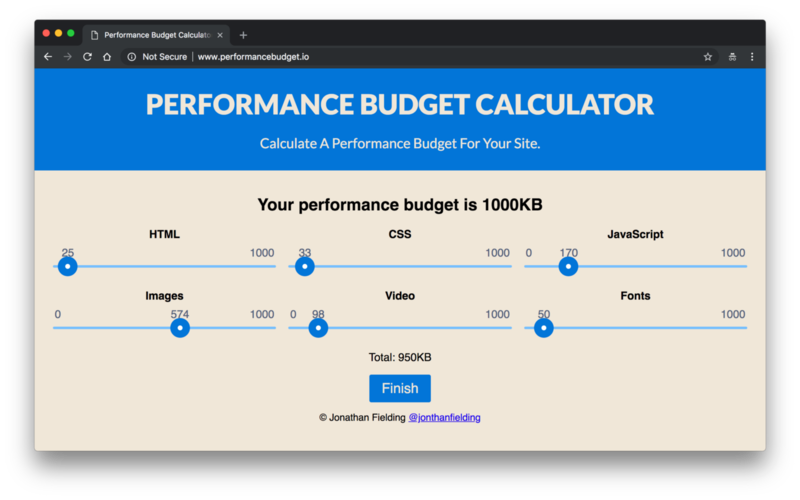 If you’re at the planning stages of deciding what your target budgets should be, https://performancebudget.io is a visual aid with presets for different network speeds. and of course, as mentioned earlier, Lighthouse CI is a great option for teams that want to enforce rule-based performance budgeting for PRs.